James Neiss/staff photographerNiagara Falls, NY - A rainbow came out for the Maid of the Mist IV and its passengers as they head for the dock on the U.S. side of the Niagara River. Across the river, passengers are taking one of the last rides on the iconic tourist attraction from Canada. Thursday October 24, marked the last day of Canadian operations for the Maid of the Mist, with the company moving all it's operations to the American side next season. 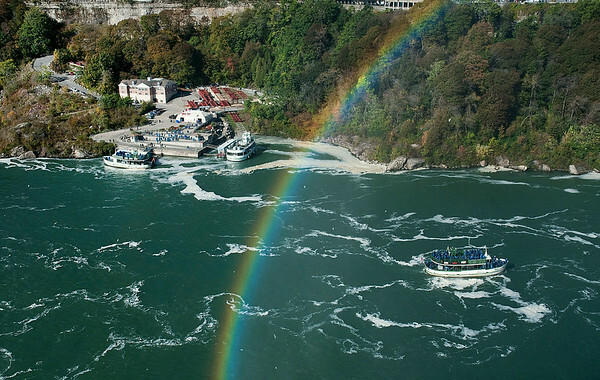 In appreciation to their customers, the Maid of the Mist is giving free rides to all this Friday and Saturday from the U.S. side at Niagara Falls State Park.